This entry was posted in Sebald and tagged James Joyce 'The Dead', Postmodernism, The Emigrants, The Holocaust, Vintage Classics, Vladimir Nabokov, WG Sebald by Simon Lavery. Bookmark the permalink. Hi Simon. 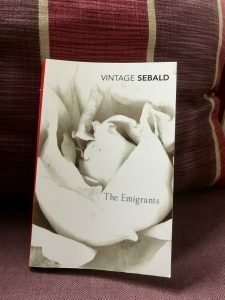 Sebald’s “The Emigrants” is so challenging! Thanks for this! Your take makes so much sense. It has been ten years since I read it, but I want to add this. The problem of mis-remembering is born out in the section about Japan – several things about that are incorrect. But I no longer have the paper I wrote about that! so I cannot cite chapter and verse. The notion of ‘incorrect’ doesn’t seem to apply to these kinds of musings from Sebald. He often writes words to the effect of ‘I remember, or may have imagined…’ Memories are slippery concepts for him. * Love Sebald’s absolute originality and brilliance. * I like the wrestling here, the postmodernist struggle, which is hard to even verbalize (which is what inspired my attempt to capture it intuitively, below, in a song about Rimbaud) the erasure of what one tries to record. But then again, I am a Celtic dreamer and potterer-about, and definitely not as sensible as Mrs. TD! P.S. The first line of the song refers to “ice poems melting in the sun.” The slow forgetting of his early, winter poems at 14 and 15 in northern France. Now, he travels with his goods on the harsh trade routes of Colonial Africa, preoccupied with business, dysentery, and sleeping rough. All of the images, the arrow, the violin and the “abracadabric” ship were taken from Rimbaud’s poems. Re: He mentions the ‘lack of memory that marked the Germans, and the efficiency with which they had cleaned everything up’. They had, he feels, collectively erased history. Just occurred to me now, there is a disturbing aura of “disappearing” now in some of the U.S./Israeli policy to Palestinians, with a challenge to any idea of a “right to return” for those in Lebanon, Jordan, etc. It is a form of annihilation, which risks turning Palestinians into stateless people. And Poland’s recent criminalisation of any statements about their role in the Holocaust. Or Turkey’s attempt to silence any mention of the Armenian genocide. I’ve never read anything by Sebald. I’d never even heard of him until Charles Saumarez Smith mentioned him in his remarkable blog (or was it in an interview ? ), a few years ago. I thought I would read Austerlitz to begin with, but after reading this post several times I think I’ll give this one a go first. P.S. You may impress your followers, but not your wife :-). He’s a remarkable writer. Maybe good to start with The Emigrants, and Vertigo, which reads like a code that only gradually makes sense. Kafka, hunters, Stendhal etc. Austerlitz was a sign perhaps of the direction he was starting to take when he died so horribly early. Yes, Izzy, you’re right: my wife sees right through my pretension! Nothing wrong with a little spousal poking of a hole in the ego balloon! But as a lexophile myself, I think “pretension” is the incorrect word here as it implies a poseur. You may more accurately be described as elite (in the positive sense), and possessed of a finely tuned sensibility. This can be applied to all sorts of things, but the telling feature is an ability to make fine distinctions that may totally escape the more sensible and earthy of folk. Assessing scent, food, music, subtle atmospheric changes, tiny distinctions in the meaning of two words, it probably is good for an aspiring poisoner as well! But I think it is in-born. I know a rough working class guy who is an incredible blender of scotch due to his infallible nose and tastebuds. Over and out, lots of thoughts today! Thanks for the link, Moira. Just read your post – a typically enigmatic scene! Hi Moira.. fellow reader here at Simon’s wonderful site, and I am looking forward to reading your blog on Sebald. Don’t be discouraged if there is no initial reception or warm response to your passionate take on Sebald… my ex-husband was a huge fan of Robert Aickman in the 1980’s when he was virtually out of print and had pretty much only a cult following among fanatical horror fans. So, “Rings of Saturn” it is!